At Last - the TRUE Secrets of Occult Powers are Revealed! Did you ever wonder where so-called Occult powers really come from and - more importantly - how you can TRULY tap into this mystical well-spring for yourself? Are you ever dismayed at how so many people do so much better in life than yourself, with seemingly very little effort? Do you want to learn how to become successful, using the very same powers of that mighty magicians and sorcerers used centuries ago? It could well be that you, like so many before you, have felt that you simply aren't one of those people who good things in life will EVER be drawn to. Perhaps you've even resigned yourself to working, day-in, day-out, for a pittance for the rest of your life and having to make do with an unsatisfying existence? Well the truth is - YOU DON'T! What if I were to tell you that there is NOTHING you cannot accomplish, and master Occultist Carl Nagel could set you upon that path to doing just that - within mere DAYS? This astounding book is nothing less than the secrets of Occult power, stripped-bare. In New Way to Esoteric Power, everything you ever need to know about harnessing immense personal power is explained in simple, easy-to-follow steps, that ANYONE can master. This is powerful, transformative Magick at its very pinnacle! Author Carl Nagel is one of the most highly-respected authorities on Occultism today. This amazing book is the culmination of decades of his carefully-documented, PRACTICAL experience of working with the hidden powers of the universe - powers which you can now use to transform your OWN life RIGHT NOW! Let us reassure you, right now, that there are no black Magickal rituals or spells here; no need to use blood, call upon Satan or pay night-time visits to graveyards. The information here is purely transformative. The Secret Key - revealed! Secrets from Beyond Earth, Air, Fire & Water - how to bring the devastating power of the elements to bear upon your will. The Psychic Alchemy Initiation Ritual. First Signs of Your Awakening Occult Powers. Contacting &Working With Your Personal, Wish-granting Genii. The Ritual of the 7-Petalled Lotus. Psychic Alchemy Incantations for Wealth, Luck & Protection. Psychic Alchemy Chants, to Bring you all the Money, Love & Success you will Ever Need. Channelling Your Psychic Alchemy Power Through the Mighty Magnifying Force of no less than TWENTY Included Talismans of Power! Amazing Rituals of Cosmic Elemental Magick. Unique Psychic Alchemy Invocations Using the Legendary Talisman of Solomon. All of the above represents only a portion of the truly powerful contents of this remarkable book; although we will not go into detail here, also included are the names and means of contacting 40 different Spirits, each dedicated to bringing your desires into reality. And best of all, the methods here are EASY! You WON'T need incense, altars, swords or any of the other paraphernalia that other Magickal books insist you use; Psychic Alchemy develops, and is projected, from YOU - not some old hazel twig that you have to cut from a tree in a Churchyard! This is possibly the most POWERFUL book of Occult instruction you will ever own, and it's ONLY available from us. Our first print-run of this title SOLD OUT on the day the book was launched, and this second run is also selling very quickly indeed. 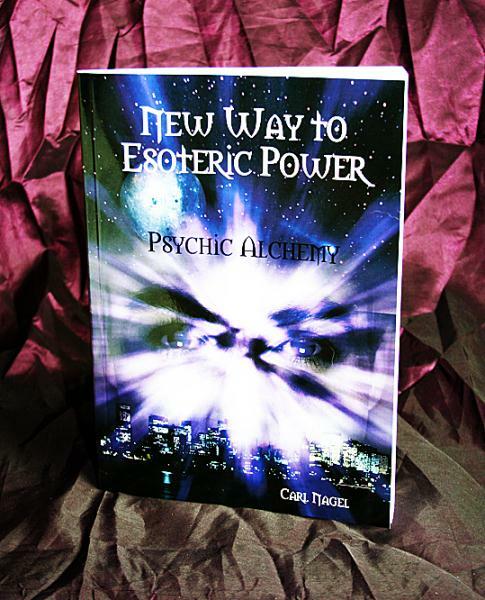 Make sure you DON'T miss out, and order your copy of New Way to Esoteric Power NOW!